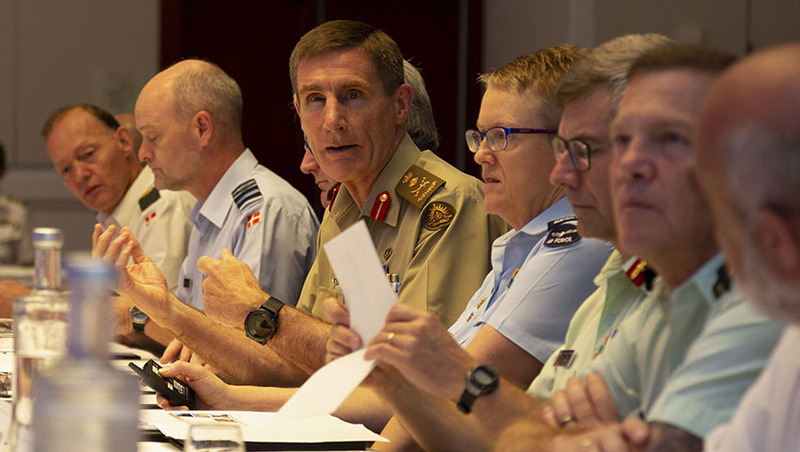 Chief of Defence General Angus Campbell has stressed the ever-present threat of cyber crime to top European officials at an international policy institute in Brussels. GEN Campbell's concerns regarding cyber espionage and intellectual property theft echo the growing concerns of the government, which has significantly stepped up its funding of cyber security in recent years. "The opportunities that the connected world provide are very significant, with the potential for very significant damage, both to companies and to institutions that we hold dear and also to states more broadly," GEN Campbell said in his address. "We've seen companies suffer devastating electronic attack. We have seen institutions undermined and we have seen countries shut down. "All of these things have happened and there's a potential, therefore, for them to happen into the future." GEN Campbell also noted that there has been an "extraordinary up-tick" in cyber crime, which includes international espionage, economic theft and corporate crime, and pointed out that the internet is currently "ineffectively governed". The Chief of Defence avoided pointing fingers at any specific country, saying it's more of a global issue than any one nation. "The question at play nationally is how do we appropriately build some effective governance mechanisms without losing the value we all appreciate from the internet," GEN Campbell said. "This is a really important part of the modern evolution of our societies, our economies and our body politic." China, Russia, Iran and North Korea account for the majority of "significant cyber incidents" worldwide, and as recently as last month, Chinese hackers were discovered having compromised the European Union's communication systems, allowing them access to sensitive information for several years.